At a press conference in Rome at noon today, Google’s Michael Jones and Rome’s mayor Gianni Alemanno (cough) are announcing “Ancient Rome 3D” — The city of Rome as it was in 320 AD, brought to life via 6,700 buildings and monuments, 716 separate textures and 250 informational placemarks on historically accurate terrain. It’s an entirely new kind of default layer for Google Earth — one that mirrors history as well as geography. 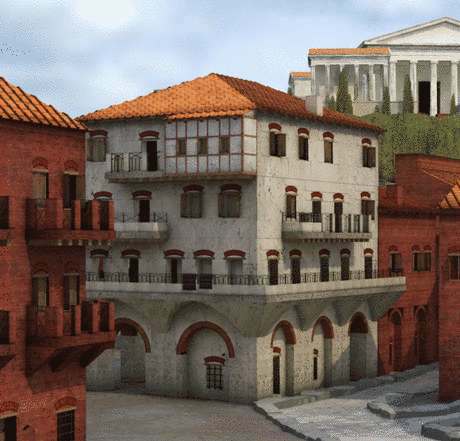 In 1997, the Institute for Advanced Technology in the Humanities (IATH) at the University of Virginia began a collaboration with UCLA and Politecnico di Milano to build a digital model of Ancient Rome that would become Rome Reborn 1.0. The starting point was Gismondi’s physical model, which they proceeded to digitize. That process proved to be fascinating, as IATH director Bernhard Frischer described in a talk in 2007 at the US National Endowment for the Humanities. It’s worth excerpting a longish passage of his speech, available as a PDF. We scanned the Plastico di Roma Antica with a Metric Vision LR200 laser scanner. […] From our scan results, you could reverse-engineer the model, but the results were not at a level of quality that was adequate for virtual reality applications. There were distortions all over the results that we got. [… W]e were able to find some very smart students […] and put them to work on our idea of deriving algorithms to go through all the scanned data and infer the underlying geometric forms. It turned out there were thirty-eight simple geometric forms for the buildings and about another twenty for the roofs. So to summarize, […w]e have the born-digital Class I hand-made models of 31 buildings in Rome. […] For the moment, the other (ca. 234) Class I buildings are included in Class II, the schematically represented buildings not known in any detail. These buildings were made first by scanning the “Plastico di Roma Antica,” then by reducing the scan data to a library of basic geometric types, and finally by hand modeling these types. Hence, we can classify our overall city model as a hybrid meta-model. It is hybrid insofar as it was made by a combination of hand and scan modeling. It is a “meta-model” insofar as it was inspired by the physical model of Gismondi, making it (in part, at least) the model of a model. In the CityEngine, grammar rules have been designed under the guidance of archaeological consulting. These rules have then be applied to refine the mass models, resulting in detailed 3D building models, which then can be exported into any 3d package or visualisation software. The Rome Reborn dataset has now also been exported as a collection of KML Collada models with the help of Past Perfect Productions (beware Flash site) — and that’s what you get in Google Earth’s Ancient Rome 3D layer. The buildings aren’t quite as gorgeous in Google Earth as in a professional 3D authoring and visualizing tool (duh), but they are now available to anyone in the world with a broadband internet connection, and that leads to some intriguing opportunities. Google knows this too, of course, which is why they are sponsoring a Ancient Rome Curriculum Contest for K-12 school teachers in the US. There are many great historical novels set in ancient Rome, from Robert Graves’s I Claudius to Robert Harris’s Imperium to Gore Vidal’s Julian. 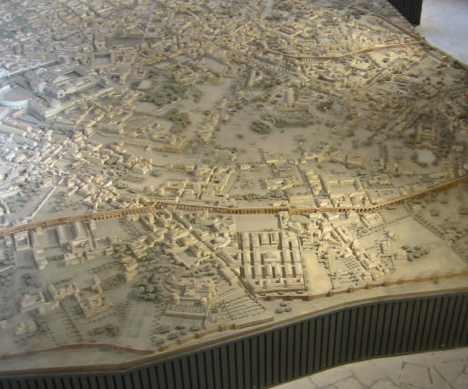 The latter is set in Rome of the 350’s and 60’s AD, within a generation of the model now visible in Google Earth. I can’t wait for the literary placemark tour. Another possible use for the new Google Earth layer: placing your own modern photos of Roman monuments in such a way that they mimic the view you’d have had, had you been there in 320 AD. I’ll try to make one once the layer is live. One more detail: I talked to Google Geoteam product manager Bruce Polderman briefly for this embargoed piece, and he cautioned that while all the class 1 buildings are in accurate placed and ready, the class 2 buildings might still see some “floaters”, but that they’ve been focussing on getting the class 1 buildings right and will be updating the class 2 buildings in the coming weeks. The russian is online too gospodin ! Interesting. It’ll put all other projects reconstructing Rome in 3D in an instant media-shadow – for good and for worse. BTW Google Earth’s ability to handle time could really shine here allowing the user to see the development of Rome from 753 BC with its mud huts to 320 AD and beyond. The time-axis and analysis of change in the material record is what archaeology is all about (unless your ragingly pomo of course…). So I downloaded the new Google Earth, went to Layers and to Gallery, clicked on Ancient Rome 3D and it showed me a bird’s-eye view of modern-day Rome… what the…? And I see a bird’s-eye view of modern-day Rome too. So what’s wrong with my setup? I am so confused….where will I find the instructions? I seem to be having difficulty getting anywhere in seeing Ancient Rome and really want to use this feature in a kids history class this week…. 1. In Google Earth, turn on the “Ancient Rome” layer in the “Gallery” directory (bottom left of your screen). 2. Make sure the 3D buildings layer is turned off. 3. Zoom in on Rome, click on one of the yellow icons. You’ll see three links: To terrain, to the main 250 buildings and to the rest of the buildings. 4. Click on the terrain link. The terrain for Ancient Rome starts to load. 5. Wait a while. Then click on the link for the 250 buildigs. 6. Both layers take a long time to load. You can eventually also load the third layer. Where are these instructions??? I searched the manual, googled, …! When trying to see Ancient Rome,as soon as I choose a building the error message: 4.3.7284.3916_beta_081122-230505_dmp comes up and that is the end,it closes.Anby ideas,please? Thank You very much google team……..
why dont I have that layer in my gallery ?? I have installed google earth v .4 ??? is it only US users that have this layer ? I don’t see the submenus that they show in the youtube video. It shows breakdowns in the videos of Roman baths. how do I get those?